19) C. Xu, C. C. J. Loh*, J. Am. Chem. Soc. 2019, 141, 5381-5391. A Multi-stage Halogen Bond Catalyzed Strain-Release Glycosylation unravels New Hedgehog Signaling Inhibitors. 18) C. Xu, C. C. J. Loh*, Nat. Commun. 2018, 9, 4057. 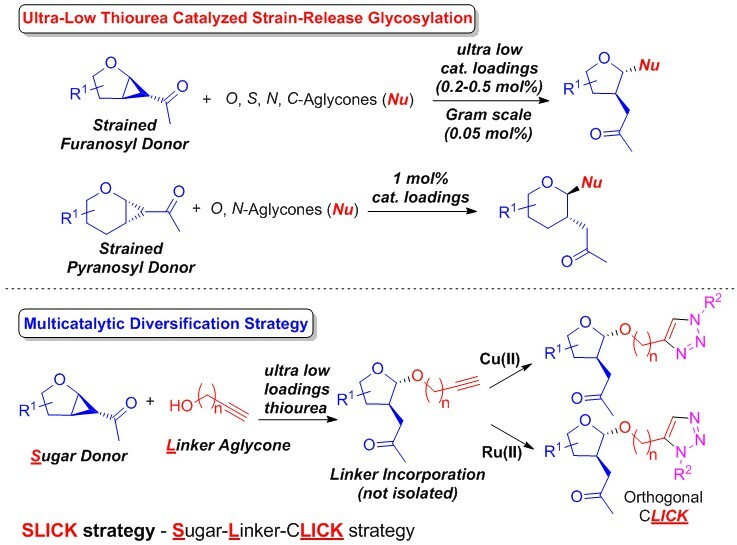 An ultra-low thiourea catalyzed strain-release glycosylation and a multicatalytic diversification strategy. 16) C. C. J. Loh, M. Schmid, R. Webster, A. Yen, S. K. Yazdi, P. T. Franke, M. Lautens*, Angew. Chem. Int. Ed. 2016, 55, 10074-10078. 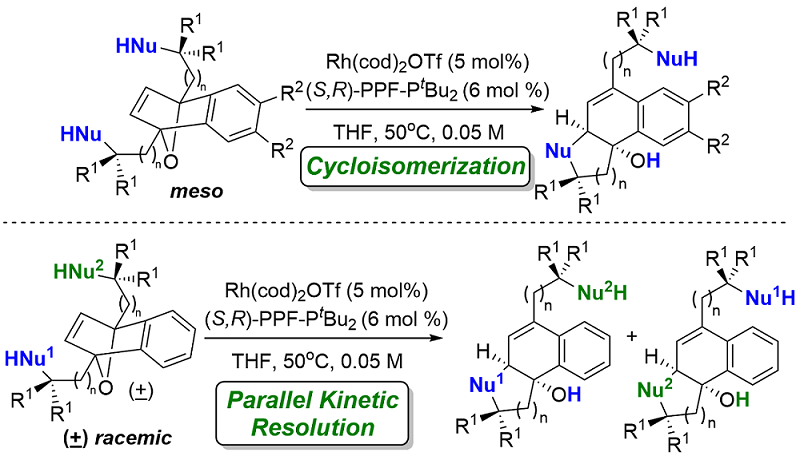 Rhodium Catalyzed Asymmetric Cycloisomerization and A Parallel Kinetic Resolution of Racemic Oxabicycles. 15) C. C. J. Loh, M. Schmid, B. Peters, X. Fang, M. Lautens*, Angew. Chem. Int. Ed. 2016, 55, 4600-4604. Exploiting Distal Reactivity of Coumarins: A Rhodium Catalyzed Vinylogous Asymmetric Ring Opening Reaction. 14) C. C. J. Loh, X. Fang, B. Peters, M. Lautens*, Chem. Eur. J. 2015, 21, 13883-13887. Benzylic Functionalization of Anthrones via the Asymmetric Ring Opening of Oxabicycles utilizing a Fourth Generational Rhodium Catalytic System. 13) S. Mahajan, P. Chauhan, C. C. J. Loh, S. Uzungelis, G. Raabe, D. Enders*, Synthesis 2015, 47, 1024-1031. Organocatalytic Asymmetric Domino Michael/Henry Reaction of Indolin-3-ones with o-Formyl-b-nitrostyrenes. 12) P. Chauhan, S. Mahajan, C. C. J. Loh, G. Raabe, D. Enders*, Org. Lett. 2014, 16, 2954-2957. Stereocontrolled Construction of Six Vicinal Stereogenic Centers on Spiropyrazolones via Organocascade Michael/Michael/1,2-Addition Reactions. 11) D. Hack, C. C. J. Loh, J. M. Hartmann, G. Raabe, D. Enders*, Chem. Eur. J. 2014, 20, 3917-3921. Merging Gold and Organocatalysis: A Facile Asymmetric Synthesis of Annulated Pyrroles. 10) C. C. J. Loh, P. Chauhan, D. Hack, C. Lehmann, D. Enders*, Adv. Synth. Catal. 2014, 356, 3181-3186. Rapid Asymmetric Synthesis of Highly Functionalized Indanols via a Michael/Henry Organocascade with Submol% Squaramide Catalyst Loadings. 9) Q. Ni, H. Zhang, A. Grossmann, C. C. J. Loh, C. Merkens, D. Enders*, Angew. Chem. Int. Ed. 2013, 52, 13562-13566. Asymmetric Synthesis of Pyrroloindolones via N-Heterocyclic Carbene Catalyzed [2+3]-Annulation of α-Chloroaldehydes with Nitrovinylindoles. Asymmetric Domino Synthesis of Indanes bearing Four Contiguous Stereocentres catalyzed by Sub-mol% Loadings of a Squaramide in Minutes. 7) C. C. J. Loh, I. Atodiresei, D. Enders*, Chem. Eur. J. 2013, 19, 10822-10826. Asymmetric Organocatalytic Michael/ Henry Domino Reactions through Hydrogen Bond Activation: A Kinetic Access into Indane Scaffolds Bearing cis-vicinal Substituents. 6) J.-P. Wan, C. C. J. Loh, F. Pan, D. Enders*, Chem. Commun. 2012, 48, 10049-10051. Enantioselective Organocatalytic Domino Synthesis of Tetrahydropyridin-2-ols. 5) C. Wang, X. Yang, C. C. J. Loh, D. Enders*, Chem. Eur. J. 2012, 18, 11531-11535. Organocatalytic, Asymmetric Synthesis of 3-Sulfenylated N-Boc-Protected Oxindoles. 4) C. C. J. Loh, G. Raabe, D. Enders*, Chem. Eur. J. 2012, 18, 13250-13254. Enantioselective Synthesis of Tetrahydrocarbazoles Through a Michael Addition/ Ciamician-Plancher Rearrangement Sequence. Asymmetric Synthesis of a Potent Constrained Analog of MS-245. 3) C. C. J. Loh, D. Enders*, Chem. Eur. J. 2012, 18, 10212-10225. 2) C. C. J. Loh, D. Enders*, Angew. Chem. Int. Ed. 2012, 51, 46-48. Exploiting the Electrophilic Properties of Indole Intermediates: New Options in Designing Asymmetric Reactions. 1) C. C. J. Loh, J. Badorrek, G. Raabe, D. Enders*, Chem. Eur. J. 2011, 17, 13409-13414. Merging Organocatalysis and Gold Catalysis: Enantioselective Synthesis of Tetracyclic Indole Derivatives through a Sequential Double Friedel–Crafts Type Reaction. (Highlighted in Synfacts 2012, 8(1), 97, Contributors B. List, M. Mahlau).